“Why does tonight, have to end? It’s been a bit since I last created an entry and I deeply apologize for those of you who enjoy seeing my work. The real world has been a handful lately and it’s kept me from completing projects like the one you’re reading and seeing now. Hopefully things will calm down just a bit so that I can get more great looks to you and keep you informed about what’s out there. I have been enjoying the skin and eyes that you’ve seen become more of my overall look as of late. While I am still going to showcase new items that catch my eye or are even a part of my great sponsors, I like just a little bit of normalcy with my non-blogging life as well and this has helped with that. Last month at The Men’s Department, I picked up the “Quinn” hair from +elua+ and because I enjoy the products the brand puts out it was almost a sure necessity that I get this one because of the ties to part of my name even if there is not any direct affiliation. It’s a nice mid-length hair that is combed to the left side of the body. It has excellent textures and comes in many color packs which may cause you to have to make a decision…that is unless you get the full fatpack and just wear the ones you like whenever you want to. Every once in a great while I find something great at Uber, which is very female-centric with male items thrown in every once in a great while. Gabriel has released an outfit that you could easily wear together or separate with other brands of clothing to mix and match but I honestly can say that it looks really good together so you may find it hard to. The “Half Pants In Shirt” is a long sleeved partially open tucked in formal type shirt. It comes in three different colors (Blue, Dark Gray, and White). The other half of the outfit are the “Suspender Half Pants” which are knee length shorts that have pulled down suspenders resting upon the sides of each leg. You can get these in black, khaki, and olive. Keep in mind that even though this outfit goes together the pieces are sold individually or in fatpacks of the three shirts together and also the three shorts together. The “Summer Drive” pose set from Come Soon Poses really caught my eye when I was looking for a very cute couples type pose that I could set somewhere that had exceptional views, such as Netherwood. 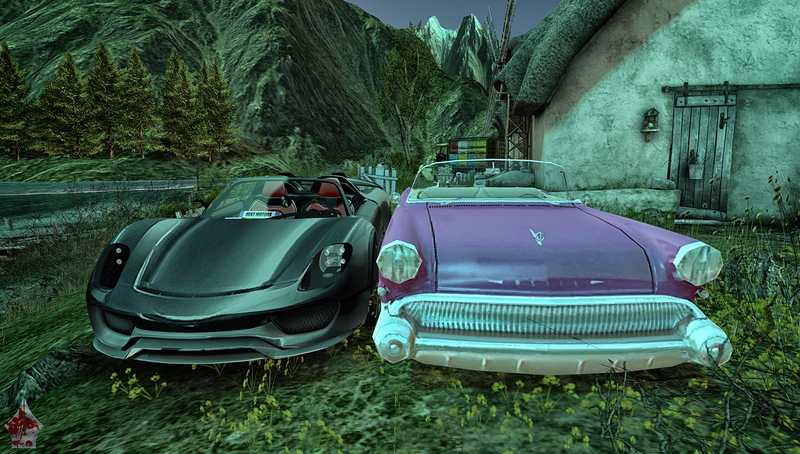 The cars that are a part of this pack are very well detailed and work really well to give that overall romantic feel. I’ve also included in the style credits the look of what my lovely assistant is wearing. Just in case any of the ladies taking a look at this like what they see and want to do a bit of shopping as well. That takes care of another entry for me and now that you know more about the look and what went into it, you can venture down below into the credits for transportation to the fine stores and events that make up what you see. I look forward to bringing you another great new look soon but until then as always, stay stylish fellas and stay classy gals!